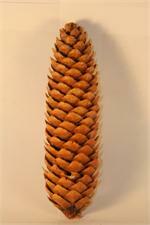 Gold, Silver, and White tipped cones on a pick. Norway red pine cones are about golf ball size and make a great addition wreaths, homemade decorations, pine cone crafts, and other wreath ideas. 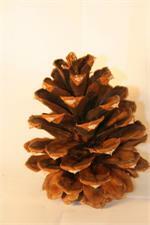 Ponderosa pine cones are our most popular pinecone and easy to use for all of your crafts projects. Add to handmade wreaths, ribbon bows, or other floral crafts. Approx 3-4.5 inches tall by 2-3.5 inches wide. White Tipped, Wired Berried, and Natural. 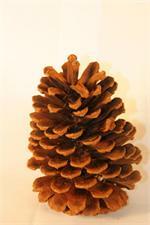 These spruce pine cones are from 4-7 inches long and about 1-2 inches in diameter, great for pine cone crafts, evergreen boughs, and other wreath decorating projects. They are sold by the bushel and are natural color. 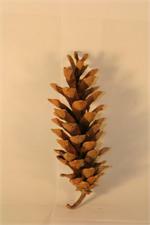 This is a triple pine cone cluster with 3 Austrian pine cones wired together for wreath decorating projects, ribbon bows, evergreen boughs, and pine cone crafts. White Pine cones are a cost effective and stunning way to decorate your homemade wreaths, evergreen boughs, and other wreath making ideas. Sold by the 4 bushel.